Tesla's CEO talked crypto during a new interview. Elon Musk is talking cryptocurrency. The real Elon Musk, not one of those Twitter scammers. On Tuesday, Tesla’s CEO sat down for a podcast interview with ARK Invest, a tech investment firm. In addition to chatting about electric vehicles and self-driving cars, the interviewers decided to throw Musk an “off-topic” question about cryptocurrencies. 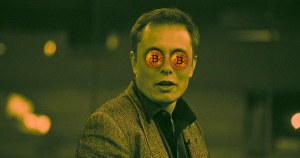 After an initially incredulous response — “Crypto, seriously?” — Musk went on to elaborate on his thoughts about crypto and Bitcoin in particular — and while he sees the value in both, don’t expect Tesla to get involved in the space any time soon. “It might be for coke,” Musk deadpanned, in an apparent drug joke, prompting laughs from his interviewers. As for whether Tesla would ever get involved in crypto, Musk doesn’t see that happening any time soon. His company’s primary goal is to “accelerate the advent of sustainable energy,” according to Musk, and as he noted during the interview, mining cryptocurrencies is computationally energy intensive. “I’m not sure it would be a good use for Tesla resources to get involved in crypto,” he concluded. “No, we’re not,” Musk replied.